Forgive our capitals-explosion, but we're a little shocked right now. Nokia just announced a cameraphone with a 41-megapixel sensor. FORTY-ONE MEGAPIXELS. Naturally Nokia's sticking with Carl Zeiss lenses, but that 41-megapixel camera can shoot 7728 x 5354 photos in 16:9 format, or if you prefer 4:3, in 7152 x 5368. There's just one thing: It runs Symbian. As snappers know though, it's not just the size of the sensor which counts. Nokia spoke of a feature called "over-sampling" which does something special with the pixels, grouping seven of them together to create one super-pixel, with the GPU processing one billion pixels per second. This basically means you can choose which size to take the photo in, from 5, 8 or 38-megapixel options. Zoom-wise, it can lock in to up to 4x digitally, and if filming any 1080p video, it can zoom right into 3x (or 6x if you downgrade to 720p). Along with being a camera, the 808 Pure View is also the first Nokia phone that can record audio in high-definition, plus has Dolby Digital Plus too. On sale in May, for 450 Euros—which is around $600. Suddenly their teaser trailer from last week makes a whole lotta sense. But, err, Symbian? 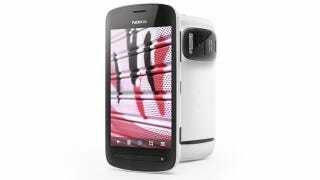 For more deets about the 808 Pure View, check out Nokia's release here.